The science of yagyas is as old as Creation. Lord Brahma performed the first yagya. When he performed the yagya, he sacrificed a part of himself. From his sacrifice manifested 33 devs and devis, who took charge of various aspects of Creation. Lord Brahma became the Prajapati, the Creator, responsible for physical Creation. Lord Vishnu took upon the role of Preserver, he who runs the Creation. Lord Shiv became responsible for the journey back to the source. Yagyas are the means to nourish Creation, to give back to Creation and the various energies that run it, all that they have provided for. In every yagya there is a havi (oblation), that which is sacrificed or given back. And, this sacrifice is not of someone else, or of an animal; the sacrifice is of self or an aspect of self. Lord Brahma sacrificed a part of himself. Ravan too sacrificed his head nine times and only then he had shiv darshan. Puranic texts abound with instances of men, devs and asurs performing yagyas, and in all these yagyas they sacrificed a part or desire of self. Yagyas are of various kinds. The foremost is the yagya for Prajapati Brahma, who is the progenitor of all, to whom we owe our life, body and experiences of the manifested Creation. It is the duty of a human being to give back to the Creator. Performing this yagya ensures the flow is maintained from the Creator to self. It is upon individual capacity and desire then, what he/she can manifest from Brahma. The next yagya is for the dev or devi, whose sadhna has been prescribed by one’s Guru. 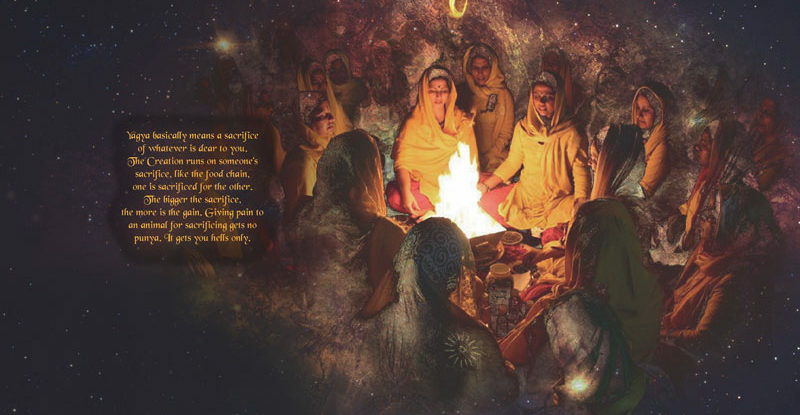 This yagya is to give back to that specific Shakti what it has released in Creation. Performing this yagya, bestows the sadhak with the siddhi of that dev or devi. The dev or devi then guides the sadhak through his/her journey and their shakti can be utilized by the sadhak to fuel his/her sadhna. A third kind of yagya is for the fulfilment of a task, ‘karyapurti’, for example, the chandiyagya, rudrayagya, ashvamedha or rajasuya. When you perform such a yagya in Guru sanidhya, the purpose for which the yagya is performed materializes with certainty. However, these yagyas should only be performed when one has accumulated suitable karmic strength. Everything in Creation is bound by karma, including the Trinity. There is no escape from it. Even if you attain something in the physical through a yagya, in the absence of requisite karmas, it will be at the cost of something else, which will be taken away from you to balance out karmas. Therefore the yagyas for karyapurti are not prescribed to all and sundry. Next there are yagyas, which are performed, not for someone specific or towards specific end, but simply as a duty by virtue of being a human and a part and parcel of Creation. Agnihotra falls in this category. Then there are yagyas, which pertain to the food chain, to the co-existence of various aspects of Creation. For example, a tree performs a yagya all its life, sacrificing itself to provide us food, air and shelter. As humans it is our duty to perform a yagya for the tree, by nurturing it. If we do not do that, the tree would perish and with it we will too. Similarly the cow, it bears immense pain and agony to nourish us with its milk. It then becomes our duty to perform a yagya for the cow, by protecting and providing for it. In fact, every entity in Creation is performing a yagya, the sun is burning everyday to give us heat and light, the earth bears our weight to sustain life, the winds blow, the rivers flow. Each is performing a yagya. Tapasya or penance too is a form of yagya. Every human has to perform tapasya to give back to Creation. Only then is he entitled to human birth and body and related pleasures. The ones who do not perform these yagyas move into the yonis of bhoots and pesach. At Dhyan Ashram, the sadhaks have traversed various lokas and yugas with me and interacted with all kinds of entities and know this for a fact. We need to give back to Creation and yagya is a means to do that. Yagya basically means a sacrifice of whatever is dear to you. The Creation runs on someone’s sacrifice, like the food chain, one is sacrificed for the other. The bigger the sacrifice, the more is the gain. Giving pain to an animal for sacrificing gets no punya. It gets you hells only. Guru prescribes a yagya and mantra sadhna as per the desire and capacity of the sadhak, which opens doorways to the subtler dimensions. It is extremely important here that the mantra uchharan in a yagya be done by the siddha of the mantra. Correct uchharan bestows phenomenal siddhis, the results of an incorrect or faulty uchharan can be catastrophic. To experience the power of yagya, you may contact Dhyan Ashram.